Irritable Bowel Syndrome (IBS) is the most common gastrointestinal disorder in the world. Patients with IBS are prescribed more medications, account for greater overall direct healthcare costs, miss more work days, have lower work productivity and higher suicide rates than patients without it. Cutting-edge scientific research finds that IBS is nearly always connected to anxiety and depression, through something called the gut-brain axis. Heal the gut and you can heal the brain - and vice versa. This book offers a natural healing protocol that alleviates IBS - and the anxiety and depression that nearly always accompany it. 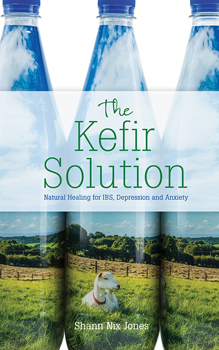 Working with the powerful natural probiotic kefir, Shann Nix Jones has developed the Happy Gut Solution - an all-natural and chemical-free method to help heal IBS. It is a method that has plenty of health benefits and no negative side-effects. The Kefir Solution contains practical information as well as stories, tips, and recipes, in a conversational, easy-to-read book that combines common sense and uncommon science to help you and your family.